My nails are not my favorite body part because not only I have a short nail, my hand is too dark that so it's difficult to pull off bright nail polishes. Bottom line, they never really look appealing in my eyes. However, as I grew up, I have been trying to accept it and make the best of it. Once I bought a nail art kit which end up not working for me since I don't have the skill to use it, so i just stick to Nail Polish only. After a while, I bought several good nail polishes just because they makes me feel better when I apply them and not because they look good on my nails. And several years ago, I remember that pastel green shade became really popular and Essie was one of the brand that released this color. Since then, so many YouTube Gurus raved about pastel green nail polish from Essie and they influenced me to try this brand as well. 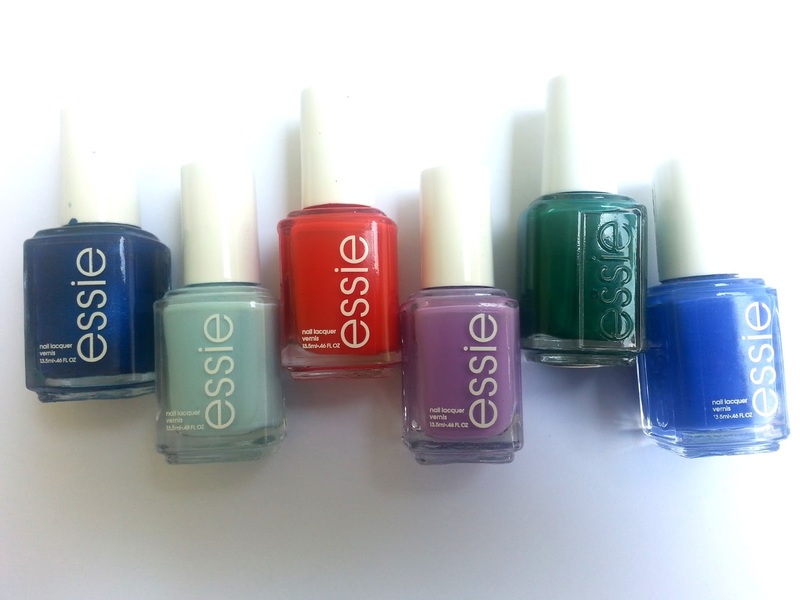 Now I am proudly converted as Essie's Girl when it comes to a nail polish. One thing that really drawn me to this nail polish is the packaging. It's so minimalist and simple, definitely my kind of packaging! And the best thing from Essie nail polish has to be the brush, it's very small and easy to use so a short nail girl like me can use it very easily but a messy result cos of Not only it's a piece of cake to use it to my own nails, but it's also easy when i apply it to my friend's nails. With my very limited knowledge about nail polish I thought Essie only release glossy finish nail polishes, but of course i was wrong since they also release the matte and the glitter ones. But I am such a glossy gal so i only picked one that has glossy and shiny finish. This color described as a frosty sapphire blue with a metallic finish. The color looks so edgy and electric and I always gets compliments every time I applied this shades. I only need 1 layer for my nail since the color is really opaque. It swipes evenly and has glossy finish which I love. This shade will look good on both fair and dark skin tone. This shades described as a mix of red and orange which really bright and pop. It has a jelly-like formula and sheer finish. I always use 2 coats of this to reach an even result on my nails. It glides smoothly and leaves a glossy and shiny look. This shades described as an emerald green and was included in Essie 2010 Winter Collection. Going Incognito is a unique green shades that reminds me of green floor tile. I know it weirds but that the way it is. It has an opaque formula that gives a shiny result. I always use 2 layers for this shades because the more opaque the better. This shades described as an indulgent bright blue. This nail polish is so blue and vibrant it reminds me of summer. I really love the color but hate the formula, it's patchy and goopy. I thought it was supposed to give me a matte result and yet it's not. It runs between matte and glossy, so go figure. One layer wont be enough for this shades because it's going to be streaky, so just go with 2 or 3 layers, oh and you also need a good top coat for this nail polish. Described as flirtatious soft purple shades. 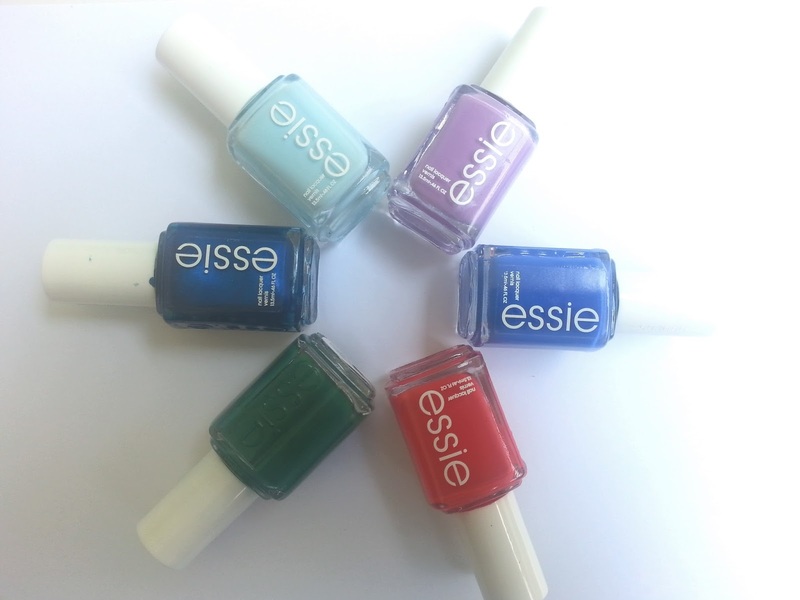 Another shades from Essie that comes with a perfect combination. It has jelly-like formula, very creamy and opaque. You can easily go with 1 layer only and it's so shiny that you don't need help from a top coat to reach a glossy finish. It dries really fast too! From all these 6 shades, my favorite has to be Aruba Blue and Going Incognito. They has a strange name for nail polish and yet I love them so much. These two colors are perfect for any skin tone and they have the same edgy vibe every time I wear it. 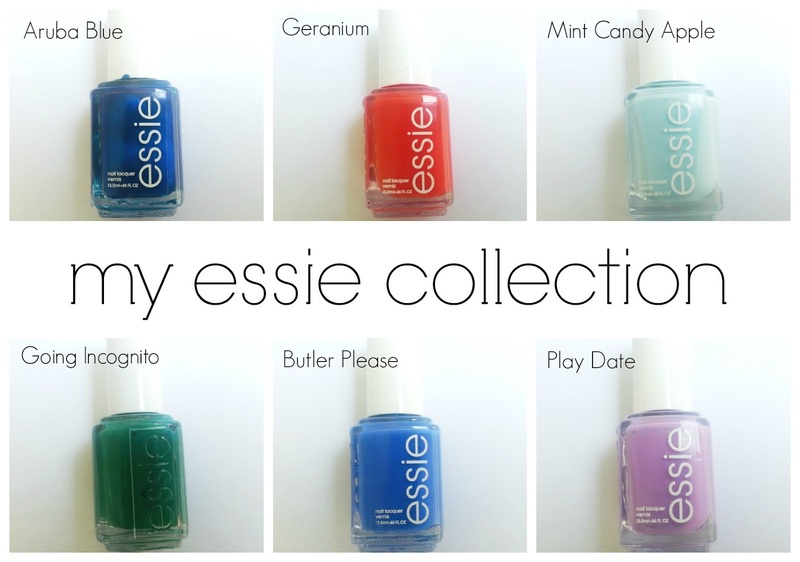 So what's you favorite Nail Polish from Essie? Hihi... ayo dicobaa rie! Emang cakep warnanya!